Atopic dermatitis — Some dogs have an abnormal skin barrier, resulting in the development of allergies to multiple environmental allergens such as pollens, grasses, and dust. Management can be difficult, but we have many tools in our arsenal to keep these guys happy. Contact dermatitis — Local irritation to the skin can occur, especially on sensitive areas like the underbelly and armpits. Endocrine problems — Systemic conditions such as hypothyroidism and Cushing’s syndrome can affect your dog’s skin and coat quality dramatically. 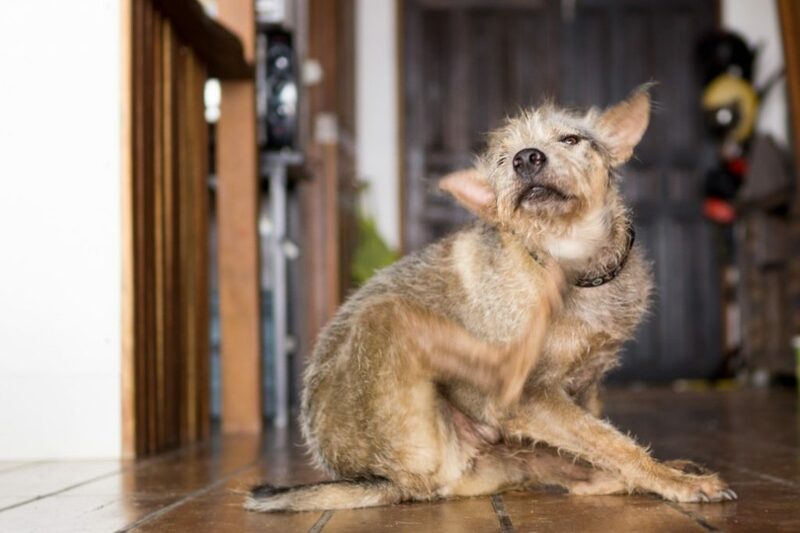 Flea allergy dermatitis — Fleas can be annoying on their own, but some pets are actually allergic to the flea saliva, resulting in an itchy condition that needs more than a flea treatment to solve. Food allergy — Pets who have allergies to a food (usually a protein like chicken, beef, fish, or soy) often have skin problems. Mange — Mange is a generic name for mites that live on or in the hair follicles. Demodectic mange is generally not contagious but can cause hair loss in affected pets, while sarcoptic mange (scabies) can be quite contagious and very itchy. Ringworm — Ringworm is not actually a worm at all, but rather a fungal organism that can cause hair loss and scaling. It can be contagious to people and other pets. Secondary skin infections — Bacterial and yeast skin and ear infections are very common, especially when another skin condition has caused inflammation and irritation. Once we have narrowed in on a diagnosis, we will prescribe a course of treatment. Often these are multi-faceted and not all pets respond in the same way. Keeping in touch with us in regards to your pet’s progress and returning for scheduled rechecks are essential to helping us to help your dog. It’s extremely important that your dog come in for a visit when trouble arises. Our expert veterinary team then can get started diagnosing and treating your pet appropriately sooner. Give us a call as soon as you sense trouble. The faster we get started, the sooner your pet gets relief.